ALL YOU NEED TO KNOW TO MAXIMIZE YOUR RECRUITMENTS ON A JOB FAIR AND MAKE YOUR PRESENCE A SUCCESS. 1. Define your participation objectives: positions to fill, profiles for the candidates you wish to attract, products and/or services to promote. 2. Identify the times that your company’s representatives will be on hand. 3.Advise your company’s on-site representatives so that they may answer visitors’ questions. 4. Promote your attendance at the fair through your website and social networks. You will attract more visitors who may be interested in your company. A few weeks prior to the event, you will receive a communication kit to help you promote your presence at the fair. 5. Bring promotional material to introduce your company. 6.Do not forget to bring application forms if you have them. 7.Smile and be attentive to visitors. Refrain from long conversations with your colleagues, as some candidates might hesitate to interrupt you and may misconstrue your potential lack of interest as a lack of commitment. 8. Devise a filing system to store the resumes you will receive based on your interests and your needs. 9. As much as possible, try not to redirect candidates to your website. They will have made the effort to come visit you in person, not to be sent back into cyberspace! Should you wish to receive resumes via the internet, we recommend that as a courtesy, you give them your contact information and request that they send their resume directly to your email address. 10. Contact the candidates whose applications seem most interesting to you. 11. Some candidates you will have met will contact you to thank you for having taken your time to discuss with them. Answer them even if you have no position to offer them. 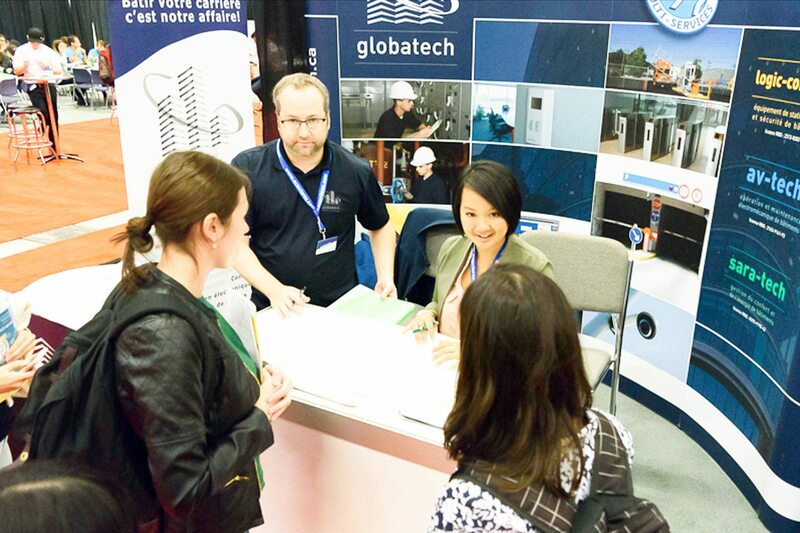 The National Career Event was created in 1999, in Montreal. His goal was to focus the company’s expertise on organizing job fairs targeting specific sectors such as technology, engineering, health, finance, aerospace, and more. Today, with our experience and solid reputation, we have become a trusted reference in the field. We also offer our expertise as a service provider, in organizing tailor-made recruitment fairs.